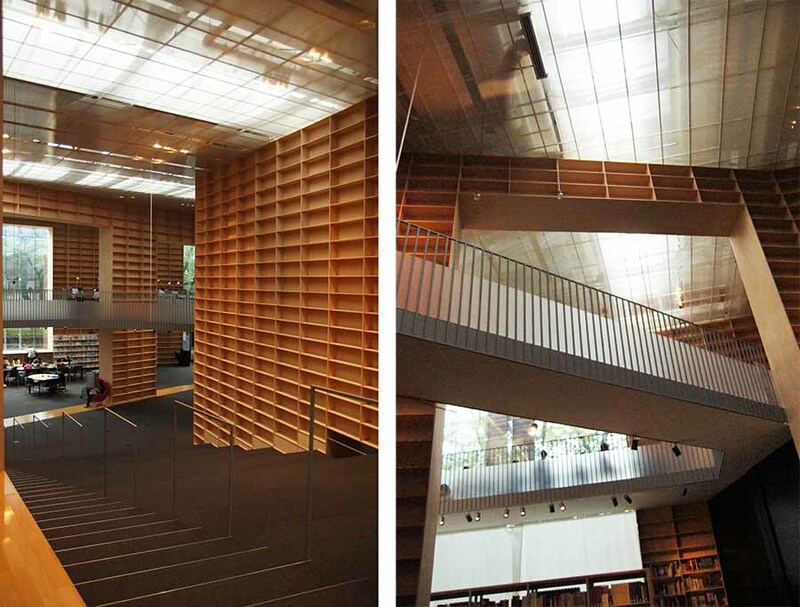 For Japanese architect Sou Fujimoto, a library is a special place that goes far beyond architecture. It’s not just a type of building, but has an existence so profound that it embraces architecture, rather than the other way around. His concept of a “library” is heavily influenced by the cryptic short story “The Library of Babel” by Argentine author Jorge Luis Borges, which is about a tower that consists of infinite floors of adjacent hexagonal rooms, each of which has four walls of bookshelves that altogether house an infinite number of books that contain every possible permutation of letters and punctuation. The librarians believe that the library mightily covers each and every possible story or theory that could ever be conceived. But how can they possibly find a specific story or story you might be looking for from unlimited random combinations of letters? No one knows. 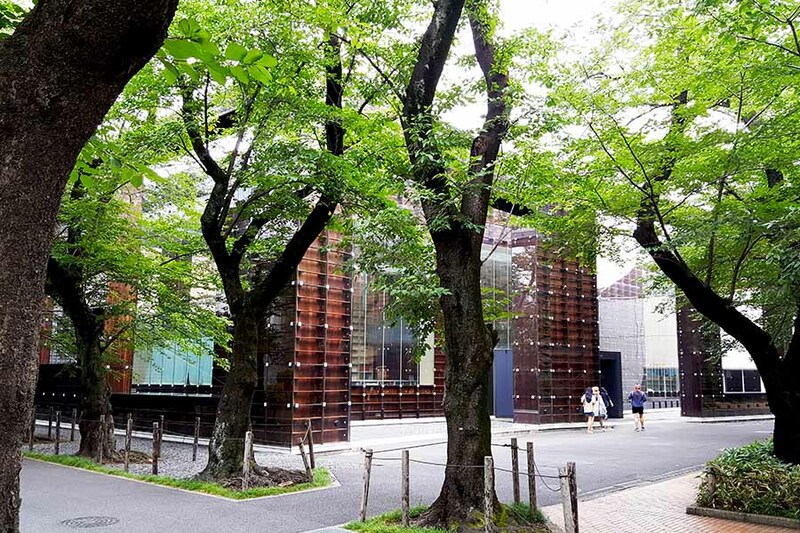 “When the Musashino Art University (MAU) library project started, I was determined to design my own ‘Library of Babel’…” remembers Fujimoto, “…because for me, it represented the essence of what a library was all about.” (reference: “建築が生まれるとき” (meaning “when the architecture is born”), Okokusha, 2010). But he was not interested in replicating the geometric shape of the library of Babel. Rather, he attempted to reflect the peculiar worldview Borges presented – a place swamped by an infinite number of books that overwhelms you with a fatal question of whether anything we conceive could actually means something. 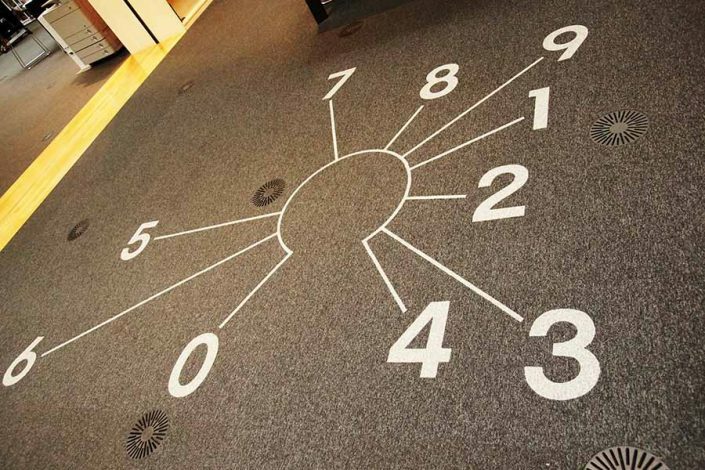 A library that is limited AND unlimited at the same time. Or, a space that is unlimited because it is limited. Instead of being hexagonal, the MAU library is spiral. 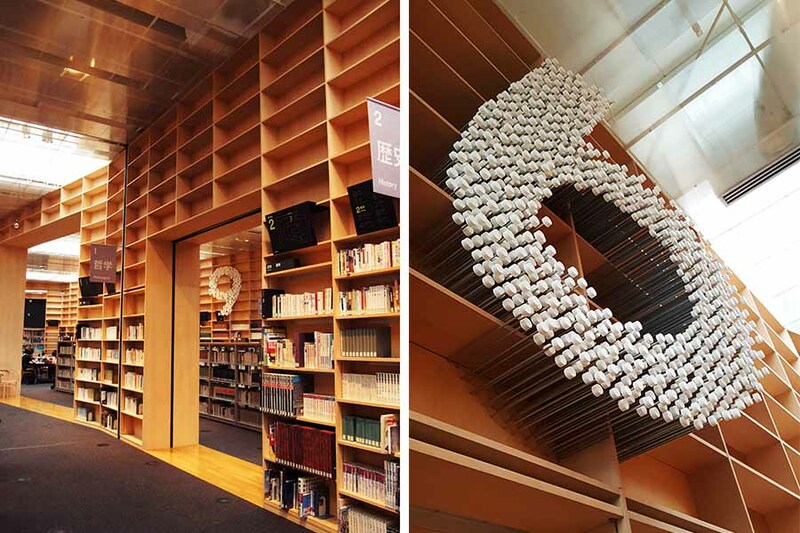 You can glimpse the exterior coils from outside, and as you go through a small, tunnel-like entrance, you are suddenly thrown into a vast world of swirling books and knowledge, which could guide you or drown you as you proceed further. It’s hard to sense how this quiet gyre ends – you feel like you have wandered into a place that has no dimensional limits. 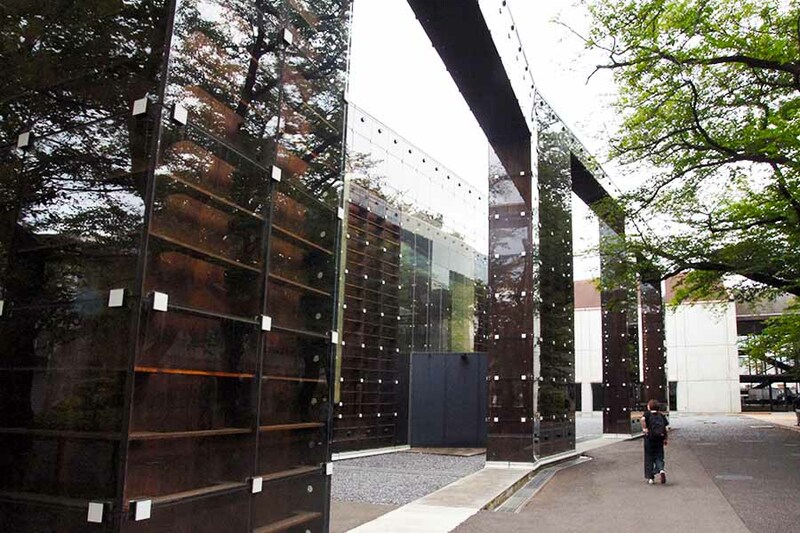 Fujimoto described it a “forest” or “labyrinth” of knowledge. 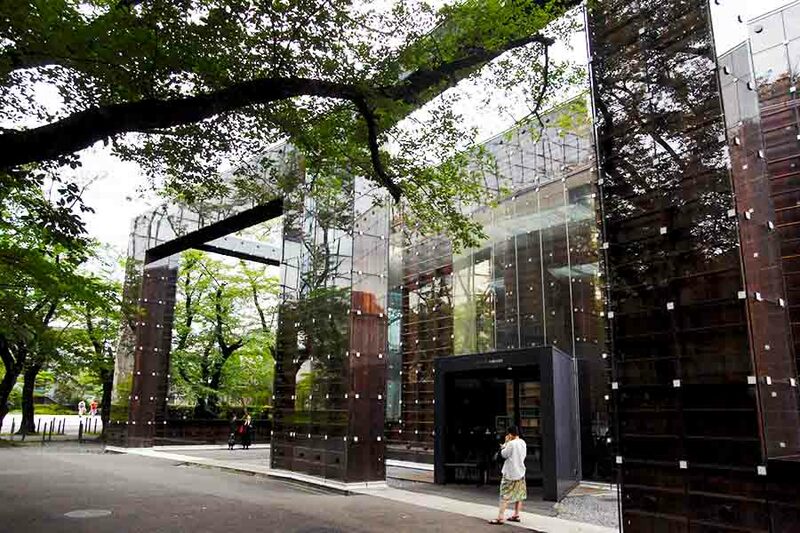 The exterior coils that enclose empty bookshelves covered by glass windows surround the actual library, which is full of books. The small blue box attached to the outer coil (almost like the “nijiri-guchi” of chashitsu, or Dr. Who’s TARDIS) leads you into the labyrinth of books. If you compare the two, forests and libraries have a lot in common. Both are an accumulation of a countless number of small units (organisms or books) that exist both independently of and dependently on the other elements, to collectively shape a large, mysterious, chaotic yet self-regulating universe. A forest has physical boundaries, but that does not mean that everything that happens inside is known and accounted for: we have little idea how small units interact with each other to form such a complex, profound whole that is always in flux but also fully self-functioning. 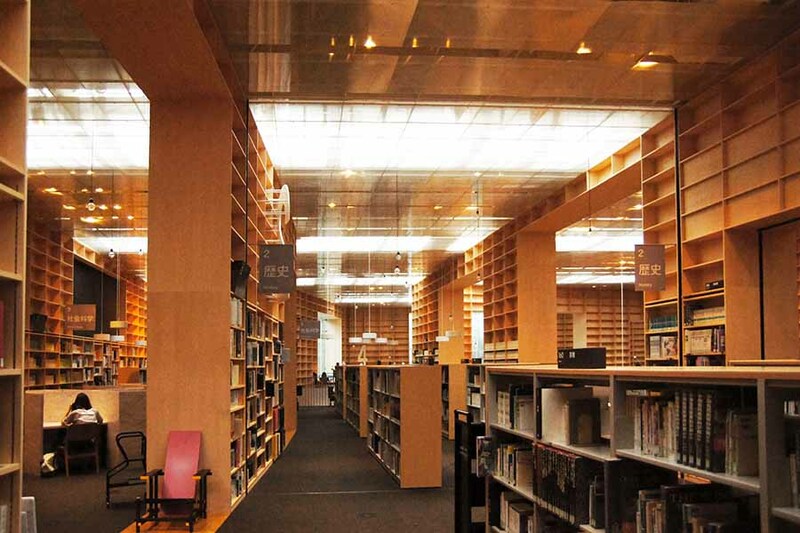 Likewise, a library stores a wide variety of small pieces of information called books to collectively form an enormous intelligent system that interconnects many intellectual subjects. It is a long chronicle of great human endeavors. But still, humans know only a small portion of the natural phenomena that occur in this universe. What we know, condensed in thousands or millions of books, implies the overwhelming world of unknowns that lie outside of them. Libraries remind us of the dual nature of our knowledge – our ability to seek truth is unlimited, but what we can accomplish in our life time is limited – by existing there with physical limitation. And such duality is not a negative one. What we still do not know is not a barrier or failure; it is a source of undefinable beauty and potential. Fujimoto’s “Library of Babel” is the architecture of awe – a mesmerizing world of duality materialized by a spiral forest that consists of books and the absence of books (in the form of empty bookcases). 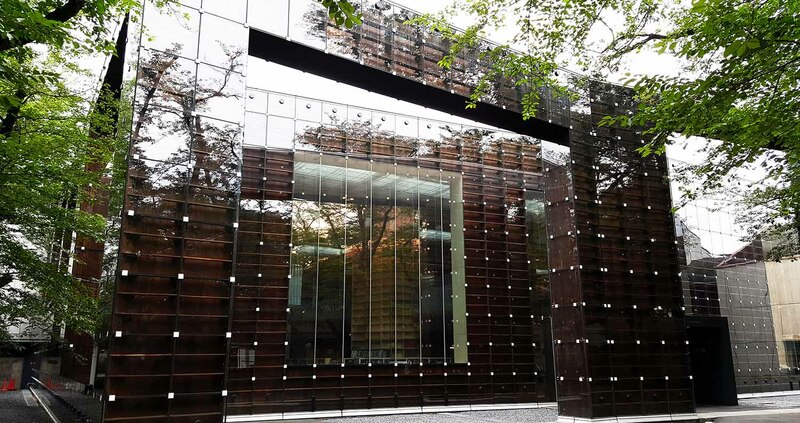 As he always does with his projects, the dimensions or dimensionality at the MAU library are somehow warped; as if you are in a forest, you lose the sense of what is close to you and what is far away. Knowledge in a book right in front of you is accessible, but there might be so much more further along the shelf that is just as relevant to you, and then there are rows of towering empty bookcases that remind you the endlessness of this universe: no matter how many books you may read, you won’t even make a dent. Intimate, apprehend-able known things co-exist with overwhelming, unknown foreign things. It is exciting, but it is also intimidating to be here because you are forced to face your smallness. You have an existence that is torn between limits and potential. 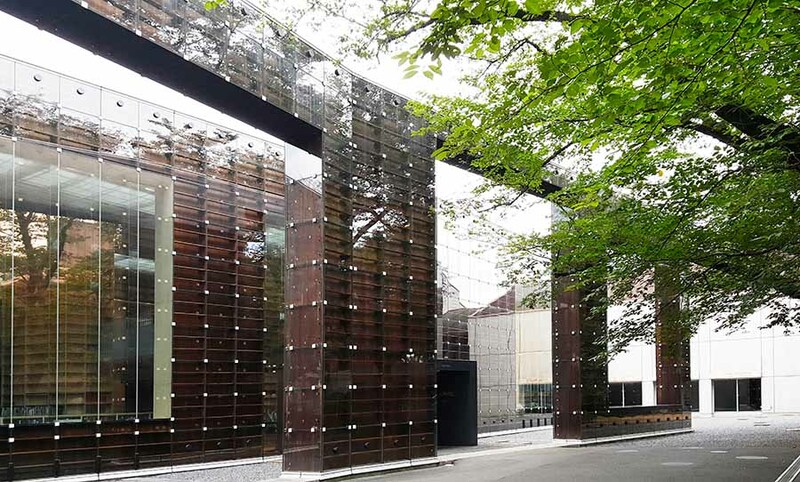 Such a worldview presented by Fujimoto conflicts with the practical purpose of a library, which is to offer an efficient/easy way for users to find the information they seek: not all of them have enough time to wander around a mysterious forest of books. So the library team came up with a method to make Fujimoto’s forest of duality a navigable one. 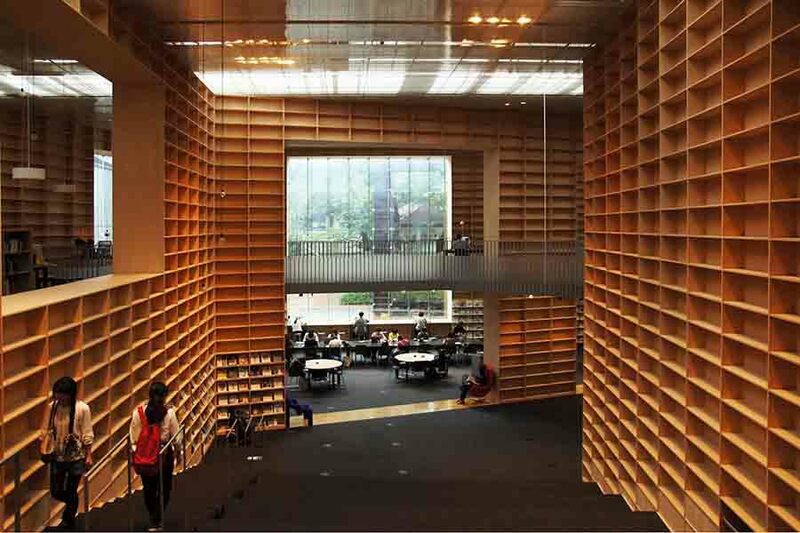 Using the Japanese library classification system (which is a decimal classification), the books are organized following the spiral layout. This gives the users two options: follow the system and go straight to what you are looking for, or forget about the classification and wander into the mesmerizing forest of knowledge. Left: The library layout based on the classification system. Right: As an art college, the MAU library houses a large volume of books that belong to category 7 – the arts. Left: You can see category 9 in between category 1 and 2. Right: Since the category 6 is “industry,” the signage “six” is made of the caps of plastic bottles. Fujimoto’s dimensional magic makes it easy for you to lose all sense of direction. It’s hard to discover the end of this building. In the same way as every forest is different, for example because of local geology or climate, every library has unique strength. 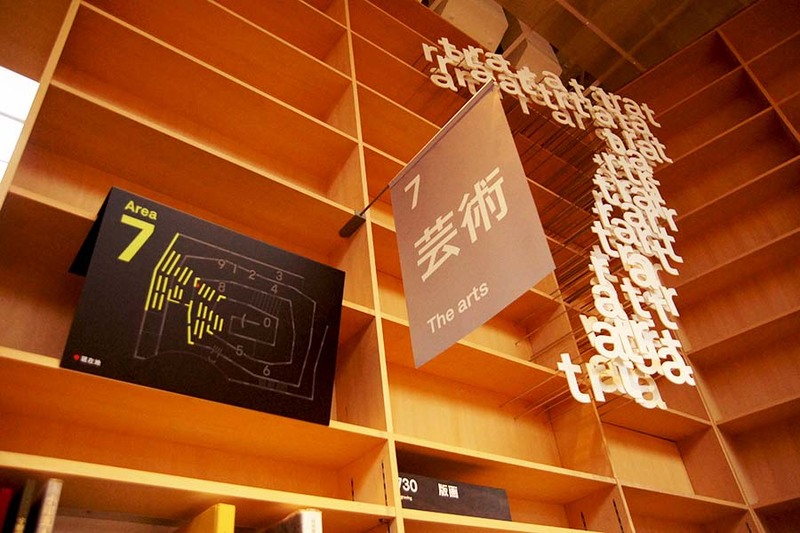 The MAU is an art university; their books are concentrated in category 7 – the arts. 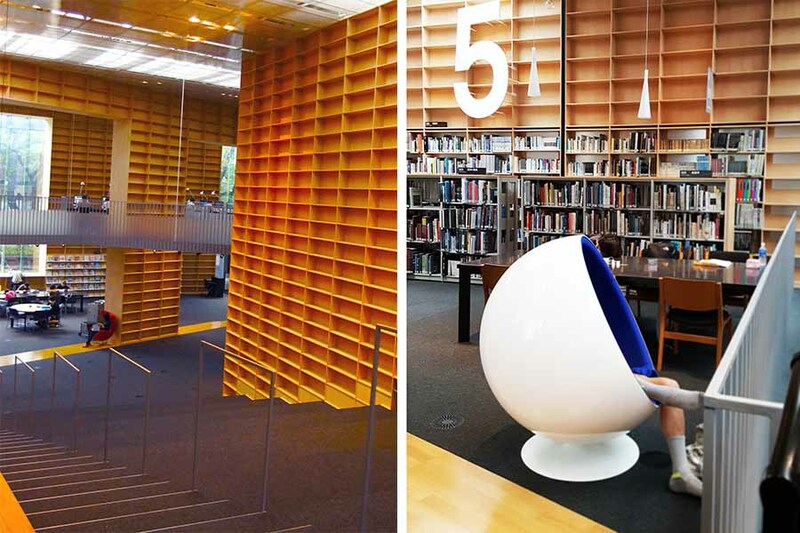 It also hosts many iconic designer chairs collected from around the world, and the users – art students – get to use them as they read books in the library. What artistic bliss! 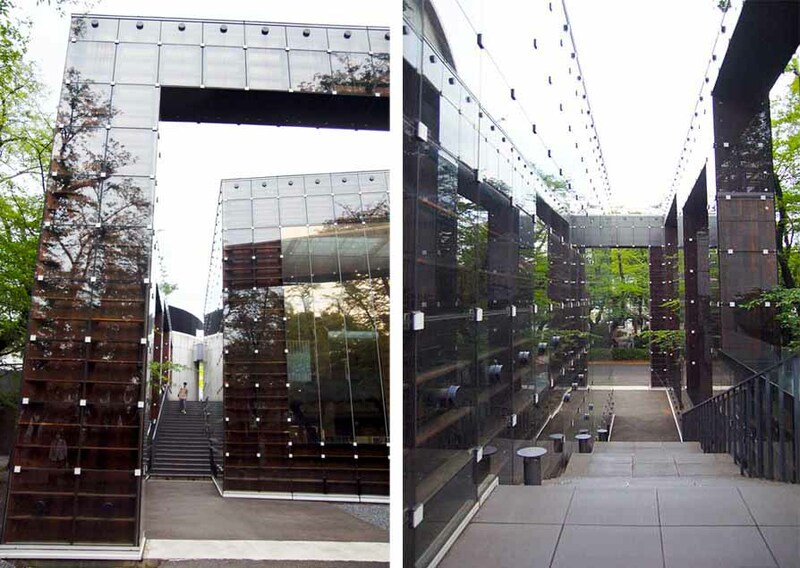 In addition, the MAU boasts a world-class creative alumni and faculty. 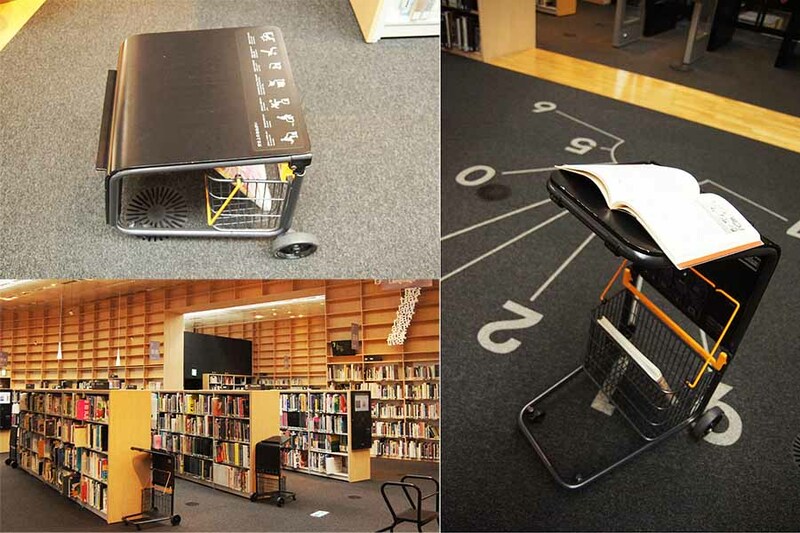 Naoto Fukasawa, who designed many iconic products, including MUJI’s wall-mount CD player, taught at the MAU from 2005 to 2014, and designed a book cart for the library. You can place an open book on the cart to read it while carrying books in its basket. If you want to sit and read, you fold the cart and voila! You now have a stool. 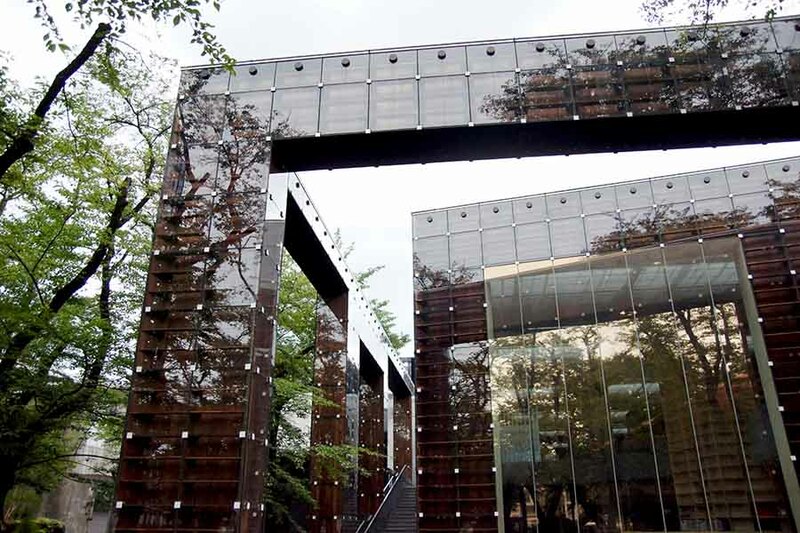 Architecture connects nature and the human world, but modern architecture today can disconnect the two because it is capable of creating almost self-completing existences that seem to function with zero help from the natural environment. Comfortably enclosed in such buildings, we forget the truth that we are indeed surrounded by so many unknowns, uncertainties and mysteries that are beyond our control. We forget to be afraid. We forget the sense of awe. 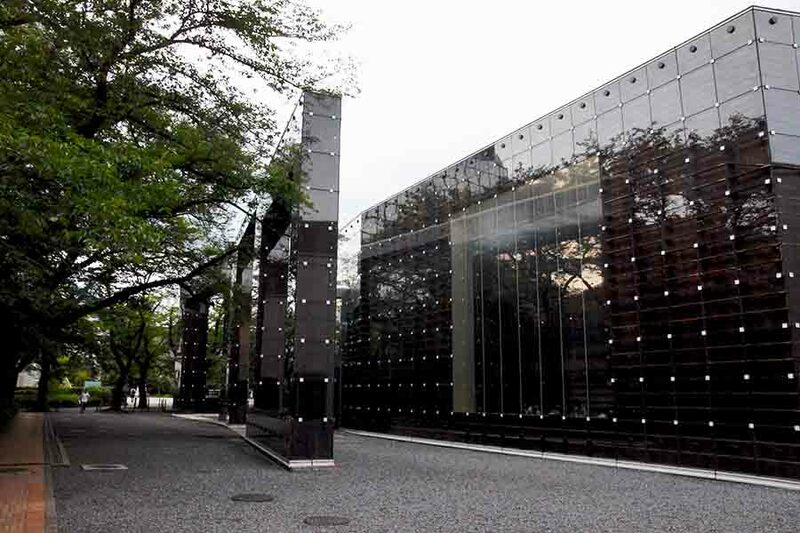 But here at the MAU library, Fujimoto beautifully reminds us that we are always living in a “Library of Babel”, which is full of books but still so stunningly empty. Regardless of our enormous collective efforts, we are still in the thick of a conundrum presented by nature. But the MAU library tells us that this not something we have to overcome or feel bad about. It is the truth that embraces us, or the environment that nurtures us. It is the source of undefinable beauty and art – as long as we remember to be awed.